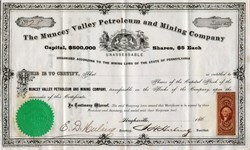 Beautiful partially issued certificate from the Muncey Valley Petroleum and Mining Company printed in 1865. This historic document has an ornate border around it with a vignette of the state seal and has an IRS uncancelled tax stamp affixed to the front. This item has the signatures of the Company’s President and Secretary, and is over 45 years old.